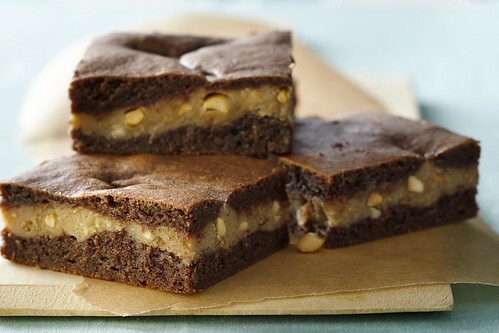 Brownies love peanut butter. These ones love it so much that they hug it all around and keep it cradled in the center. This embrace also makes the brownies delicious. Thanks to Heidi Splete of Chevy Chase, Maryland for entering it in the Bake-Off! Heat oven to 350°F. Spray 13x9-inch pan with Crisco® Original No-Stick Cooking Spray. In large bowl, beat shortening and sugar with electric mixer on medium speed until well mixed. Add eggs; beat until smooth. Add flour and cocoa mix. Beat, scraping bowl occasionally, until blended. Spread half of batter in pan. In large microwavable bowl, mix sweetened condensed milk and peanut butter. Microwave on High 1 minute, stirring once or until softened. Carefully spread peanut butter mixture over brownie layer. Spoon and carefully spread remaining half of brownie batter over peanut butter layer. Bake 35 to 45 minutes or until toothpick inserted 1 inch from edge comes out almost clean. Cool completely, about 2 hours. Store covered.